The Daniel Thomas & Kevin Sanders cdr is here! Fastest turn around ever from idea to release? Certainly so for this lummox. Transit timing observations from Kepler presents two long tracks of droning electronics with light manipulations and edits from both. This release is themed around the logistics, landscape and personality of a small section of the Sheepscar district of Leeds, an area that Daniel resides in and where I used to dwell myself, a fact we only found out after the event. Positing nothing and simultaneously providing an audiographic transcription of the location, there is a caustic energy that is slow in motion, a jaded density that is growing and moving and yet resisting and remaining. Edition of fifty copies. 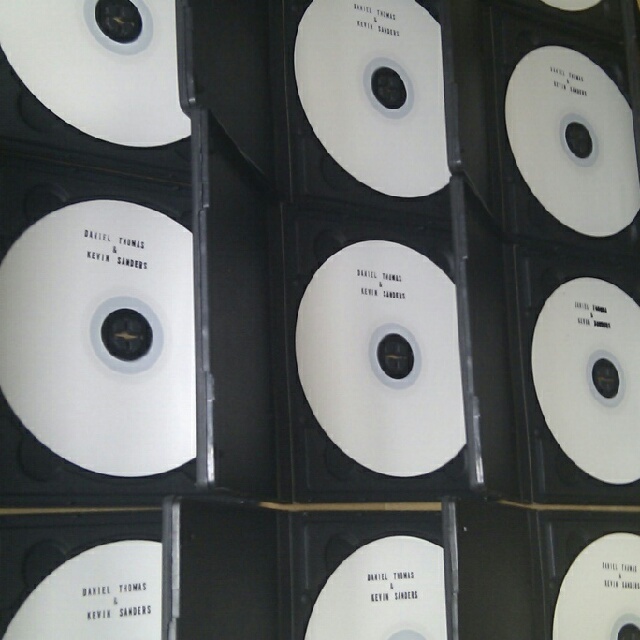 Hand stamped white top-black bottom cdrs come served in half size DVD cases (see image above,) although there are about ten in full size DVD boxes. Yeah, would love to bag myself one of these! Let me know the cost etc. Ah, yes, that is a detail I should have thought about. It is £3.00 inc p&p due to the recent increase in postage costs. A patch can be included for another £1 while stocks last, the proceeds of which will go the 1 in 12 Club in Bradford.